With the mind of an electronic producer, the body of a lo-fi psychedelic band, and the spirit of Latin inspired hip-hop rhythms, INNER WAVE creates a genre-bending brand of ethereal synth-wave that takes the listener on a journey that can get as centered or as cosmic as you see fit. This Los Angeles five-piece has been playing music together since they were 13 years old and their musical cohesion shines through. 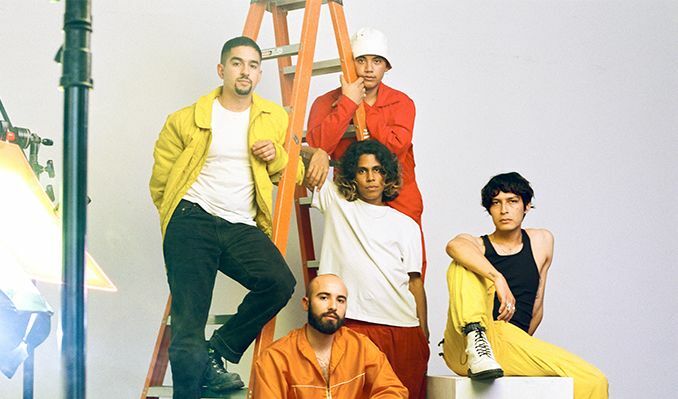 Hailing from the South-LA neighborhood of Inglewood, (an area known more for it's hip-hop roots than indie cred), Inner Wave has carved a unique sound that branches off into lo-fi psychedelia, while still paying tribute to their home in the Southland. bedroom pop band, Triathlon- selling out multiple venues including the legendary Roxy on sunset strip in Los Angeles. August 25, 2017, INNER WAVE was proud to release their full-length record, Underwater Pipe Dreams. With a lush, eclectic sound the album takes a wide range of inspirations from Tame Impala to Lil Ugly Mane. Songwriter, Pablo Sotelo, even sites sci-fi films like Blade Runner, 2001 A Space Odyssey, and A Clockwork Orange as thematic influences. Recorded at the band's home studio dubbed, "The Swamp," Underwater Pipe Dreams is an album that comes three years in the making It's a musical voyage suitable for a dance party or a beach hangout, a late night drive, or a far out dream sequence. In addition to releasing the record, last year INNER WAVE played Tropicalia Festival in Long Beach, CA and a mini-festival at The Observatory Santa Ana that included acts Tyler the Creator, BROCKHAMPTON, & Clairo.